Deputy Premier John Barilaro, left, Inverell Shire Deputy Mayor Anthony Michael, Inverell health Services Manager Hamish Yeates, Northern Tablelands MP Adam Marshall and Mayor Paul Harmon discussing the redevelopment planning yesterday. DURING his first visit to Inverell yesterday, new Deputy Premier John Barilaro visited Inverell District Hospital to be briefed on the progress of planning for the impending $30 million redevelopment. Northern Tablelands MP Adam Marshall invited the new National leader to the region, following Mr Barilaro’s election last week, and the local MP was keen to show him some pending and proposed project in the district. The pair was joined by Inverell Shire Mayor Paul Harmon, Deputy Mayor Anthony Michael and General Manager Paul Henry in a meeting and walkthrough with Inverell Health Services Manager Hamish Yeates. 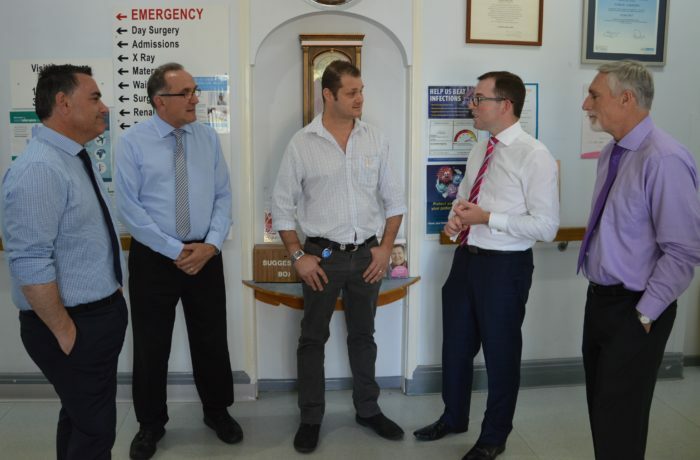 “I was pleased the Deputy Premier took up my invitation so quickly to visit Inverell and take a good look at the hospital and receive a briefing on the planning process,” Mr Marshall said. “I wanted to ensure that this project and our push for a new police station in Inverell, don’t miss a beat with the change in leadership. Mr Marshall said the planning phase of Inverell’s future hospital was continuing with significant site investigations finishing and design starting in the last month. “We were told that crucial due diligence processes were being completed as quickly as possible to ensure the redevelopment sustainably addressed the clinical needs of the community,” he said. “Since the planning process really kicked off in August this year, after the Budget allocation of $1 million, the NSW health Infrastructure project team has been making impressive headway in planning the redevelopment submission. Mr Marshall said he was pleased to hear yesterday that the project team has been focused on opportunities to maximise clinical service delivery. “I know the community is eager to see results – so is council and so am I. “It’s important that the project team take the time given to them to ensure the $30 million is money well spent and that planning reflects this value. “Everything is still on track to have the planning completed before the end of the financial year so that we can access the first chunk of the $30 million to get some construction started onsite.